If you answered "yes," then apparently you're way ahead of the curve. In one of the most comprehensive industry reports we've seen, Adobe explores how more than 1,000 marketers feel about talent, technology, strategy and performance. According to the eye-opening report—Digital Distress: What Keeps Marketers Up at Night—only 9% of respondents strongly agree with the statement, “I know our digital marketing is working.” And while 76% of marketers believe measurement is important, just 29% believe they are doing it well. The marketing talent gap is very real. Only 48% of digital marketers feel highly proficient in digital marketing. The Adobe study found that most digital marketers lack formal training, with 85% acquiring their digital marketing knowledge on the job. 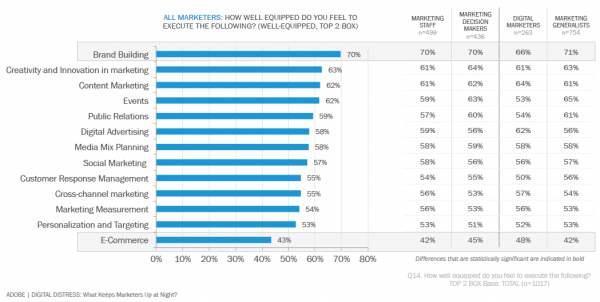 The lack of training and formal education is affecting marketers’ confidence. When asked how well equipped they feel to execute critical marketing functions, marketers demonstrated low levels in key digital areas, including: “Personalization and Targeting” at 53%, “Marketing Measurement” at 54% and “Social Marketing” at 57%. Related: Download Evolution of the Prototype Marketer: The Hybrids are Coming, which explores PR 20/20’s take on the marketing talent gap—and how to overcome it. Seventy-six percent of marketers feel marketing has changed more in the last two years than in the last 50. Largely driven by technology advances, marketers are being called upon to take unprecedented roles in the selection and activation of new marketing solutions. According to a widely cited Gartner report, the CMO will spend more on IT than the CIO by 2017. Marketers are becoming technologists, and the traditional-minded professionals and organizations that fail to adapt will be left behind. The rate of change is only expanding the technology gap that exists in marketing today. 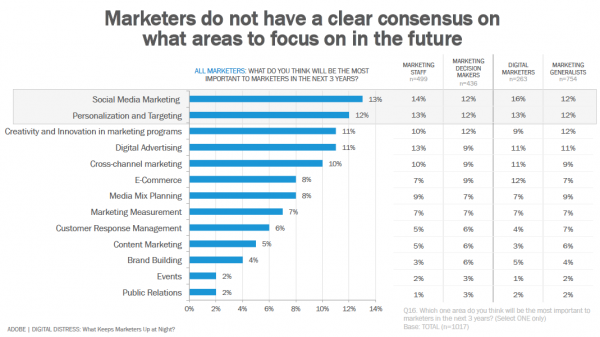 When asked, "What do you think will be most important to marketers in the next three years?" the most popular response was, "Social Media Marketing" at 13%, with "Personalization and Targeting" next up at 12%. 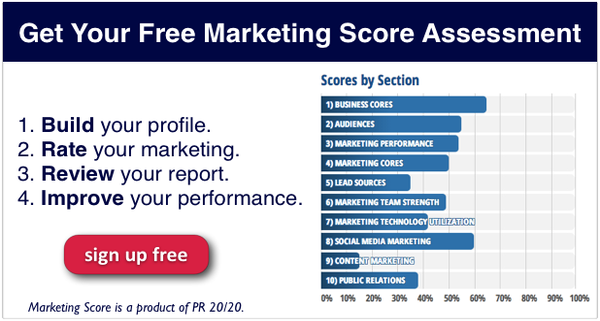 Interestingly, "Content Marketing" was 10th out of 13 possible responses. Considering all the attention and budgets being given to content, I thought this was an intriguing outcome worth noting. The lack of consensus could simply be attributed to variances in industry, budgets, company size, geographic region or any number of factors, or, it could be highlighting a growing strategy gap in which marketers are lacking the knowledge and capabilities needed to effectively prioritize activities and allocate resources. Gaps in talent, technology and strategy are leading to the most significant gap of all—the performance gap. Sixty-eight percent of marketing professionals feel more pressured to show return on investment on marketing spend, and 79% expect it will be more important in the next 12 months. However, only 40% think their company's marketing is effective. The issues of greatest concern for marketers are: reaching their customers (82%) and understanding whether their campaigns are working (79%), followed closely by proving campaign effectiveness (77%), and demonstrating marketing return on investment (75%). Seventy percent also indicated that they are concerned about using digital tools effectively, which likely can largely be attributed to points 1 (talent gap) and 2 (technology gap) above. The marketing industry is changing at an alarming rate. It's a disrupt-or-be-disrupted world in which anything is possible. To navigate the digital marketing divide, your organization will need to identify and fill ever-expanding gaps in talent, technology, strategy and performance. What's your organization doing to evolve, and move your marketing forward? Are you taking a proactive approach to recruiting and training next-generation marketers? Are you using advanced marketing technology to build more agile and effective campaigns? Are you devising inbound strategies designed to drive leads and loyalty? There are two choices in the coming age of marketing. Will your organization lead, or be left behind?